Come and treat yourself at Wirksworth’s newest eatery. 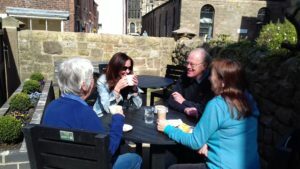 Named after the family that owned the building for over 150 years, the Heritage Centre Café is open daily from 9am until 4.30pm, offering hot and cold drinks, a selection of cakes, snacks and delicious home-made meals, including vegetarian options – all using fresh local ingredients where we can. 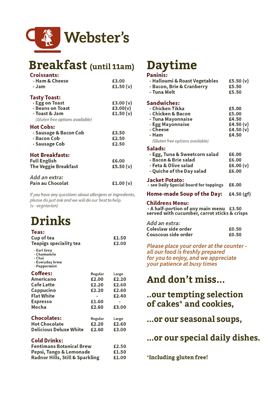 Our menu changes regularly to reflect the seasons. Walkers and cyclists very welcome! Dog owners are also welcome to bring along their pooches to our outdoor cafe courtyard. Daily specials, including gluten free, are also always available. If you have any questions about allergens or ingredients, please do just ask and we will do our best to help.